In this post, we’ll take a look at several new features along with enhancements to existing functionality with the release of Sage HRMS 2016. 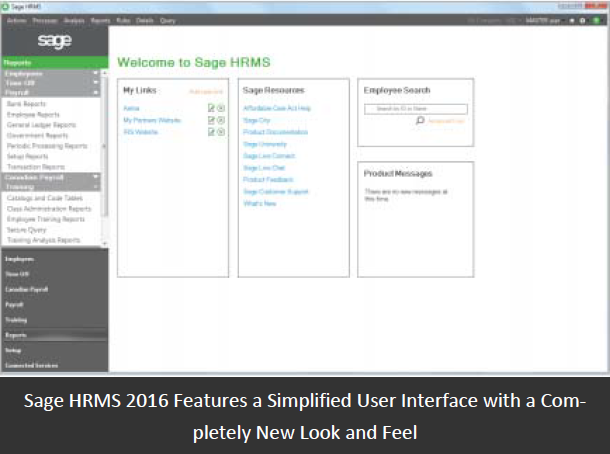 Sage HRMS 2016 features a simplified user interface and a new modern look. The most notable change is the welcome screen which is now customizable, allowing you to add your own links and shortcuts. More than just cosmetic touch up, the new interface is clean and uncluttered helping you to find what you need faster, navigate the system easier, and work more efficiently. Many Sage HRMS customers are also using the optional Sage Employee Self Service (Sage ESS) module that allows your employees to view, manage, and update their personal information. With the 2016 release, navigating between Sage HRMS and Sage ESS has been simplified. Single sign‐on functionality allows you to login just one time for access to Sage HRMS, Sage ESS, and any Sage HRMS Extended Solutions that are connected to your core system. No more multiple logins required. Administrators can also login as a specific employee (controlled by security settings) in order to assist in training or to act on the employee’s behalf and edit or update their information in the system. Sage HRMS 2016 includes enhanced photo importing functionality along with the option for employees to add their own photos through the self‐service module. In addition, document storage capabilities have been enhanced in 2016. Sage HRMS 2016 combined with My Workforce Analyzer helps you comply with the provisions of the Affordable Care Act by allowing you to generate ready‐to‐file forms 1094‐C and 1095‐C from within your HR or payroll program. While Sage Abra Suite has not yet been retired by Sage, the underlying technology, Visual Fox Pro ‐ is no longer supported by Microsoft. The final product update for Sage Abra Suite 9.1 was issued in Q3 2015. Click the link for details on currently‐supported versions of Sage Abra Suite and Sage HRMS. Contact us if you have questions about Sage HRMS 2016 or need help with an upgrade to the newest version.